The following are the latest results contributed by HM Courts Service, for cases sentenced by West Sussex Magistrates’ Court sitting at Worthing from June 12 to 16, 2017. Kaisia Hilton, 21, of Barnfield drive, Chichester, was given a community order with Rehabilitation Activity Requirement after admitting possessing a knife blade in Burgess Hill on March 29, 2017. She must pay £85 victim surcharge, £85 costs. James Wood, 33, of Crouch Cross Lane, Boxgrove, was given a community order with Drug Rehabilitation Activity Requirement and Rehabilitation Activity Requirement after admitting stealing two electric toothbrushes worth £50 from Superdrug, Chichester, on February 6, 2017; stealing alcohol worth £364 from Marks and Spencer, Chichester, on February 21, 2017; stealing alcohol worth £107 from Marks and Spencer, Chichester, on March 1, 2017. He must pay a total of £521 compensation. He admitted failing to surrender to custody at Worthing Magistrates’ Court on April 11, 2017, no separate penalty. He also admitted breaching a conditional discharge order and was dealt with for the original offence, carrying a de-tagger in connection with theft, by way of the community order. Christopher Baker, 27, of Farm Close, Hunston, was fined £40 and must pay £60 costs after admitting breaching a community order by failing to attend unpaid work on two occasions. Harry Cooper, 31, of Oaktree Cottages, Barnham Lane, Walberton, had his community order varied to include 20 additional hours of unpaid work and must pay £60 costs after admitting breaching a community order by failing to attend unpaid work on two occasions. Sidney Riding, 65, of Richmond Avenue, Aldwick, was fined £40 and must pay £60 costs after admitting breaching a community order by failing to attend an appointment, failing to keep in touch and failing to notify a change of address. David Mandeville, 49, of Elizabeth House, Macklin Road, Bognor Regis, was fined £185 and must pay £30 victim surcharge, £85 costs, after admitting possessing cannabis resin in Chichester on May 27, 2017. Jason O’Shea, 26, of Grafton Road, Selsey, was fined £460 and must pay £46 victim surcharge, £85 costs, after admitting drink-driving (51mg of alcohol in 100ml of breath) in Church Road, Selsey, on May 29, 2017. He was disqualified from driving for 14 months. He was fined £460 after admitting driving without insurance and fined £307 after admitting taking a vehicle without consent. He also admitted driving without the correct licence, no separate penalty. 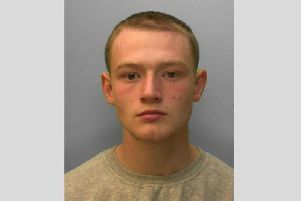 Martin Roberts, 23, of Mill Pond Crescent, Chichester, was given a community order and must carry out a total of 150 hours’ unpaid work after admitting two charges of drug-driving (>800mg benzoylecgonine and 33mg cocaine) in Charles Avenue, Chichester, on February 8, 2017; and possessing a CS gas canister without authority in Chichester, on February 8, 2017. He must pay £85 victim surcharge, £85 costs, and was disqualified from driving for 18 months.